Best Players in the World: Who is #3? A woman? Better than Messi? Better than Torres and Fabregas? No, idiots. Not “better” better. But relatively better, for sure. For a woman (and I don’t mean that as a slight, though I realize it sounds like one), Marta is perhaps the greatest player ever. Based on Cristiano Ronaldo and Kaka’s # of trophies, I will keep them above her in my overall rankings (even when factoring in relativity), but I doubt there’s a better #3 out there, “all things considered”, that is. Marta stands at a miniature 5’4″, but she plays as if she were a giant. She intimidates opponents like few others. Think Tiger Woods with a ponytail and shin guards. Although only 22 years of age, her career has already made her a folk hero in her native Brazil. In fact, after she drubbed the U.S. Under-20 National Team before a crowd of nearly 70,000 at the famed Estadio do Maracana in July 2007, they imprinted her boots in the cement outside the stadium. Previously that honor had only been bestowed on Brazil’s most brilliant male stars, like Pele. Speaking of Pele and “it’s all relative”, Marta’s nickname among Brazilians is “Pele’s cousin.” There’s no blood relation, the nickname signifies the kinship between her play and his. She has been, for all practical purposes, the Pele of women’s soccer for the last 4 years. She’s also called “Pele with Skirts”, which is ironic because I have honestly never seen a picture of her in a skirt. Heather Mitts, she is not. But beauty and soccer prowess do not always go hand in hand. After all, look at her fellow countrymen, like Ronaldo and Ronaldhino. Now, that’s ugly. Marta plays professionally in Sweden, where she was the top scorer three straight years and has never led her team to less than a second place finish. Last year, she captured the league title and was voted Player of the Year. Internationally, she has no equal either. 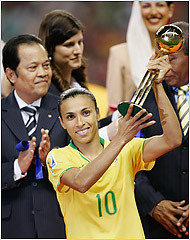 She is the two-time defending FIFA Woman World Player of the Year, and in 2005, she was runner-up. Though Brazil fell in the 2007 Women’s World Cup Final to Germany, she was the winner of the Golden Shoe (why not just say Golden Boot like in Men’s Soccer, or if you wanted to go sexist-style, how about Golden High Heel?). The only reason I keep her below Ronaldo and Kaka is her apparent inability to play her best in the biggest games. Despite the fact her Swedish team was undefeated (yes, you read that correctly, undefeated) throughout the regular season in 2005 and 2006, she and her squad choked in the league finals and settled for runner-up overall both years. She also agonizingly choked in the 2007 Women’s World Cup when she missed an equalizing penalty in the Final and never recovered. So, while she is undoubtedly the most dangerous player in the world (47 goals in 45 international appearances), she has had trouble on the biggest of stages. One big stage remains though where she could make an impact, not just on the sport of football, but on the culture of the entire world. According to published reports in South America last October, the owners of the L.A. Galaxy have considered offering Marta a deal to become the first ever woman to play in a men’s professional league. She expressed interest in such a deal when interviewed late last year. If she did come to MLS, she would be the “Jackie Robinson” not only of American soccer, but of world soccer altogether. Only the barrier she would be breaking would have been in place far longer than the one that kept Robinson out of Major League Baseball. Does she have the skill? Um, have you ever watched her play (or some of the play of mediocre male forwards in MLS for that matter)? She’s faster than most MLS defenders, and she has better technical skills than the majority of the forwards in the league now. I doubt we will ever see her along side Becks and Donovan, but I wish we would. In a world where women in some countries still aren’t allowed to watch a men’s soccer match from the stands, it would be a truly revolutionary moment to see a woman on the pitch. Sure, she’s no Heather Mitts. But, she is pretty cute. And she could kick our asses in soccer, which I think is really hot.